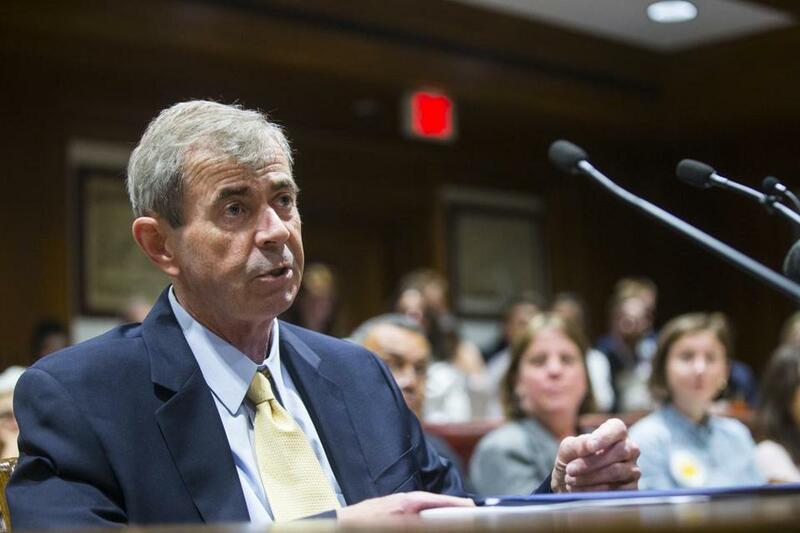 Secretary of State William F. Galvin spoke in May during a public hearing on public records reform at the State House. Massachusetts ranks among the lowest states in the nation when it comes to giving its citizens access to records, according to a survey by a Washington, D.C.-based investigative news organization, which is releasing its findings as Bay State legislators grapple with strengthening a public records law many consider weak. The center described public access to state documents in Massachusetts as “terrible,” citing in part the fact that the Legislature, judiciary, and governor’s office are exempt from the open records law, which was passed in 1973. The Globe has reported that Massachusetts is the only state in the country with such a wide exemption. “Routine records, from agency e-mails to Internal datasets, can take weeks or months to obtain from state agencies, at costs running from a few hundred dollars to the not-unheard-of multimillion-dollar bills sent to some requesters,” said authors Maggie Mulvihill and Beverly Ford in the center’s report on Massachusetts. The findings will be released Monday after midnight. More than 40 advocacy groups have backed legislation to strengthen the law, widely considered to be one of the weakest in the country. The failing grade comes at a time when some government officials and state agencies, like the State Police, are fighting legislation to strengthen the state’s public records law. The center examined the laws and practices of all 50 states in more than a dozen categories, including public records, campaign finance, ethics, lobbying regulations, and legislative and judicial accountability. Massachusetts received an overall score of D+ because of its poor showing not only in public records laws, but for other factors, such as a loophole in state law that allows anyone, including someone influential like a real estate developer or advocacy group director, to give gifts to a public employee’s immediate family, so long as the giver is not a registered lobbyist. The state received its only A for the transparency and accountability around campaign finance records, which are detailed online. Massachusetts ranked highest in the nation in the campaign finance category. Massachusetts has taken some steps to improve access to public records. In July, Governor Charlie Baker announced new measures that would require every executive office and department under his control to designate a person to handle requests, create an internal request tracking system, and provide public documents within eight weeks. “Governor Baker looks forward to reviewing the details of the report as well as any additional proposals from the Legislature that inform our efforts to make state government more transparent and accountable,” said spokesman William Pitman. State Representative Peter Kocot, a Northampton Democrat, has been pushing for a bill that would allow citizens for the first time to recover attorneys’ fees if a court rules that a document has been improperly withheld and reduce fees agencies can charge for records. But the bill has been stuck in the House Ways and Means Committee for months. Matthew G. Feher, legislative chairman of the Massachusetts Municipal Lawyers Association, said his organization wants “thoughtful” changes to the law that would shield municipalities from onerous requests that could overwhelm them, especially those with fewer resources.